Again, and again, and again, this latest one being Wednesday for Rose’s first home game at the United Center since his serious knee injury. And then Rose went out and scored the first basket with a driving layup. About an hour before tipoff in front of his locker, Rose seemed, typically, the least nervous among a scrum of media pedestrians. But that’s not good enough for everyone! We want to know and we want to know now! Can you dunk over Dwight Howard! Can you make the winning shot in Game 7 of the Finals! C’mon, already! We don’t have all day. Rose said he, obviously, was grateful to be back playing to the point he’s enjoyed coach Tom Thibodeau’s occasional wrath. “Thibs talking to me, yelling at me a little bit more,” Rose said about some of his favorite things. “At the same time, it feels good coming back in the building, being a part of walk through and not sitting on the side. I’m happy to be back playing and can’t wait for the regular season to start and the season to get going. 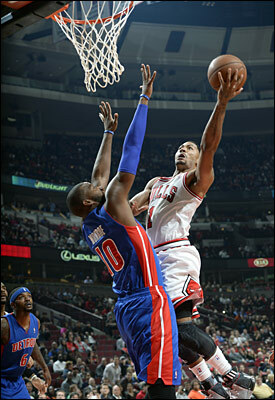 And Rose impressed with an explosive move to the basket early and a twisting layup as the Bulls went ahead 10-4. The first unofficial “MVP, MVP” chant of the season was with 6:32 left in the first and Rose shooting free throws. Rose started his first game back without his new backcourt partner to be as Jimmy Butler sat out with a bruised knee he sustained in the Washington game in Brazil. Mike Dunleavy started for him. But Joakim Noah made his preseason debut after sitting out the first three games with a groin strain. “I had an MRI,” Butler said. “A bruised knee. “Nothing major. Just taking time to rest and get back to normal. I’ve never missed a game in my career, preseason or whatever. I love going to (play) with these guys. It messed me up mentally knowing I can’t be out there with them.